On the surface game week 11 looks like a fairly good game week. Although I’ve personally found it quite frustrating. There was a slight drop on the overall leaderboard, where as I’d rather see progress in the opposite direction. Having said that, I’ve still managed to retain three transfers so hopefully this will help to set up the team going forward. The mistake I made this week was not bringing in Richarlison for B. Silva which cost a fair few points. However on paper B. Silva looked to have two decent fixtures and they were based on City scoring 12 goals. Unfortunately he didn’t manage a goal or an assist in either of those games. Very frustrating. Schmeichel kept a clean sheet. Job done in terms of that transfer. I may stick with him for the Burnley game as well. Laporte chipped in with another clean sheet. Hazard got 8 points despite starting the week with an injury. Aguero got a goal and 11 points. Kane had a good game week with 26 points. Wolves haven’t kept a clean sheet since I put Doherty in. Although he personally appears to still be playing well. B. Silva has been a player I’ve been monitoring for a while now. I think he’s finally given me an excuse to take him out with 6 points across two games where Man City scored 12 goals. Maddison isn’t picking up points on a regular basis but based on his cost I’m not sure I should be expecting him to. He is also injured for the weekend but I’d expect him back after the international break. Stick: B. Silva could be as likely to play well against Man Utd as Richarlison is to play well against Chelsea. This then retains the transfers for after the international break. Twist: Swap B. Silva for Richarlison and hope the latter gets a goal at Chelsea. Twist again: Swap B. Silva for Richarlison and Schmeichel for Kepa (despite Schmeichel having the more appealing fixture). Using two transfers for potentially little reward, based on these fixtures. I’d be interested in people’s opinions specifically on this decision. At the moment I’m favouring the option to stick and then review after the international break. Annoying again that Man City are playing late Sunday, would be good to know if B. Silva is starting before making the decision. Personally, I would hold off this week. Richarlison vs. Chelsea isnt a game you would expect a big score. Holding off would give another week to assess injuries and suspensions. Richarlison is also a doubt for the weekend gents with injury. If Pedro starts for Chelsea I’ll switch to him, if Pedro doesn’t start or I end up deciding against Pedro…..
It’ll then be a toss up between Mahrez, Ramsey and Mata depending on who’s selected etc. If he Richarlison is indeed injured what would you guys say would be the best option? Chris, I would stick for now, regretting not putting Richarlison in earlier thought with less games not playing in Europe would hinder his scoring how wrong was I yet again, I’m holding one transfer back till after international break, out of your midfield options I like the look of Mahrez, he’s proving undroppable at the moment, holding myself for now because of Manchester derby, but may drop one of my liverpool defenders for him to add some more fire power to midfield, De bruyne injury 4-6 weeks out, makes it more inviting. Thanks for your comments David. Yeah, if Richarlison doesn’t make it he’s the one I’m swaying towards for a one week punt. I’d probably want Richarlison back for that Cardiff at home fixture though. I do have 3 transfers so it could pay off, with leaving the one transfer left for Richarlison back and another for after the international break. I have 0.4m in the bank and am looking to strengthen Hart, Shaw and/or Maddison but have no idea how to go about it. Any suggestions? I could change Hart for Kepa, Shaw for Doherty and Lacazette for Martial but that leaves nothing in the bank and I still have Maddison. Only other option is to lose 1 of my 3 big hitters in Midfield but then who do I take out? I’d probably be looking to offload Maddison Sh4dow as he’s ruled out through injury. Might be worth holding onto Shaw, as although they face City this weekend, I can see them going on a bit of a run now they seems to be clicking better. Maybe time to move Hart on though. I’d be keeping Lacazette for now. Perhaps bank the last transfer for after the international break? Brooks could be a good alternative to Maddison. King still a doubt so he could be up front again? I’m thinking going with Brooks, seems to be playing advanced for Bournemouth and grabbing the odd goal lately. If he starts could be a potential especially against Newcastle. He seems to have fitted into their style of play a lot more now though. I think he was still finding his feet a little at the beginning of the season. He if starts, he’s the one I’m swaying towards should Richarlison not make it. Maddison to Brooks. Maddison injured – I know its only for one game but I don’t like any of my players missing game time. Brooks is cheaper and I have an affiliation for him anyway, being a Sheffield United fan. If he starts I’ll likely pursue this transfer. B Silva to D Silva / Mahrez. I’ll wait till the line ups of course. Not happy with Bilva’s contribution during City’s past couple days. D Silva means I’ll have just £0.2m left, whereas Mahrez leaves me more in the bank. Third transfer to be saved for after the internationals and I’ll be looking at getting Sterling in, likely either for Mane or Salah following their game against Fulham. Saying that, just seen Bournemouth fixtures! Scrapping the Brooks transfer and I’ll retain Maddison (unfortunately) for now. Who did you go for in the end? Only just got around to seeing this comment. Didn’t make any transfers in the end. Just moved house and yesterday was a big day so completely lost track of time. Probably for the best, with Silva putting in a shift! currently sat top of works league tho on 710 . Panned out quite nicely – didn’t expect much from him this weekend. Good to see Richarlison blank as well. What about moving Mane out for David Silva & keep B.Silva. I’ll probably review this one after the international break but I prefer the balance of Robertson/Mane/Salah with Laporte/B. Silva/Aguero rather than 4 City and 2 Liverpool. Think it just helps spread the risk out. I’m not making any ground up in my league so I’m potentially looking at getting Mane out but keep Salah and try get into that City midfield. D.Silva is looking very promising tbh and also looking at B.Silva to. 55 points this Gameweek. It’s not amazing but not disastrous either. Mendy 0. As daft as it sounds, I’m not overly disappointed with this one as most teams have at least one city defender. Richarlison 0. Was always going to be a tough ask for many points against Chelsea away. He stays though with Cardiff at home next. Mane 3. For a home fixture against Fulham I expected better. When’s he’s hot he’s great but seems to be a little inconsistent with his points hauls. Think his time is up as I agree with Marc, I need to get into that City midfield. Will probably offload Mane before the inevitable price drop. Kane 0. Another disappointment but scored decent points last two weeks so he stays. Robertson 15. Lovely bonus to get an assist and star man. Doherty 7. Such a shame Wolves couldn’t hang on for the CS but Doherty again proving he is THE budget player to have in your team. Hazard 8. Doing what he does best in pick up another star man. Salah. Achieved what I’d say was his minimum requirement for this week. Looks good – always interesting to hear your thoughts. I’m in a very similar situation and position on the overall leaderboard. I find it interesting that a lot of people are leaning towards taking Mane out. I like the balance of Robertson/Mane/Salah with Laporte/B. Silva/Aguero rather than 4 City and 2 Liverpool. Spreads the risk out and Mane is highly owed as well. I think I’d fear not having Mane more than I fear not having Silva. For my team though I currently have four Liverpool, two City. This move makes it three apiece. As you say I will fear not having Mane, but Silva is just producing the goods week in week out. I guess I could go for B. Silva for Richarlison but the question I have to ask myself is who do I see scoring more points over the next few weeks? D.Silva and Richarlison or Mane and B.Silva? Which do you guys think? Think I prefer the D.Silva and Richarlison option right now. Panned out very nicely in the end. Probably the best game week I’ve had over the past two seasons. Cheers – Sunday panned out to be a good day for me. Didn’t expect a lot from it either to be honest given the fixtures. A poor weekend for my team. Glad for the international break. Will take a few days off from football and then try to come with a plan. Great play from DTT. He should increase his contributions amount next season. Haha I wish – it’s a long season. Things could easily change dramatically even by Christmas, I’m just on a good run at the moment. Being sensible I would normally wait for the international break, however with the price changes and funds required I may need to make changes beforehand. Opinions on swapping Mane for D. Silva? Would this be a good move? Based on how City are more consistent (putting a few goals past most games). I can see the case for it but I’m going to stick with Mane for now. I’d worry more about not having him than I would not having Silva. Crap week for my team too…. 36 points whilst most around me managed 50-60 odd!!…. Another -3 for Shaw. He is truly hopeless!! I now find myself in a position I don’t want to be in by making a sub before Friday (Shaw for Doherty) to make sure that I don’t lose value within my team. Not ideal doing this just before an International break, but I have 3 subs and it will save me 0.2m. Currently second on my works league.. 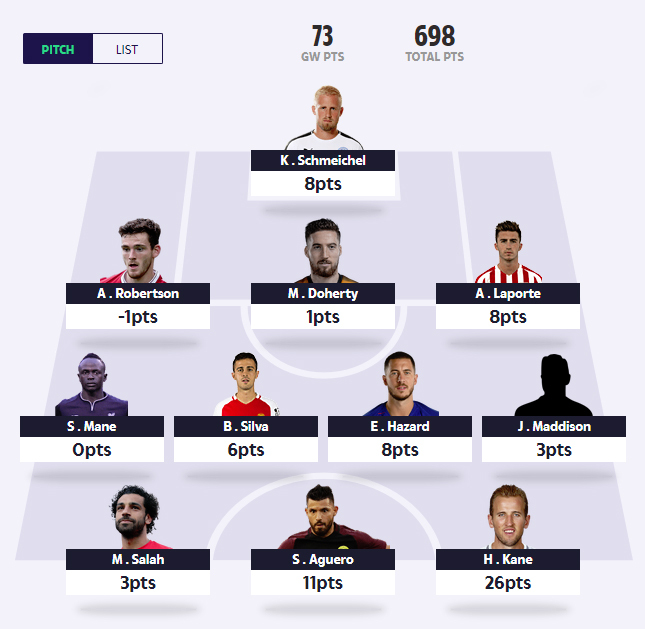 I have 740 points with only 4 points in it and looking to make a change… My current squad is. I’d be tempted to stick with what you’ve got. I keep thinking if it’s not broke don’t fix it.. but the two I’m after keep producing the goods..
Reckon I’d be more inclined to lose Rudiger than Laporte (if funds allow of course) as you already have Chelsea defensive coverage with Kepa. It’s a tough one because I wouldn’t recommend any Man Utd players given their form but they’ve got decent fixtures coming up. Surely they turn a corner at some point? My thoughts too DTT. For anyone wishing to take a gamble, Lindelof could be a good cheap punt (as well as Shaw obviously). Yes, surely he has to pick up points soon. Probability suggests this since he has earned -4 in his last 7 games, but do I want to keep him in my team with his value constantly plummeting! Even if he got a clean sheet in their next game, his recent form is so poor that he’s likely to continue dropping in price for a few weeks making it harder to replace him.